With investors struggling to digest the consequences of Brexit, political leadership in a state of flux, and a sharp fall in the value of sterling, could there be opportunities as well as risks for those able to navigate current uncertainties? Join Richard Buxton at 10am on Wednesday 13 July, for his latest thoughts on the UK economy and large cap equities in the aftermath of the EU referendum. 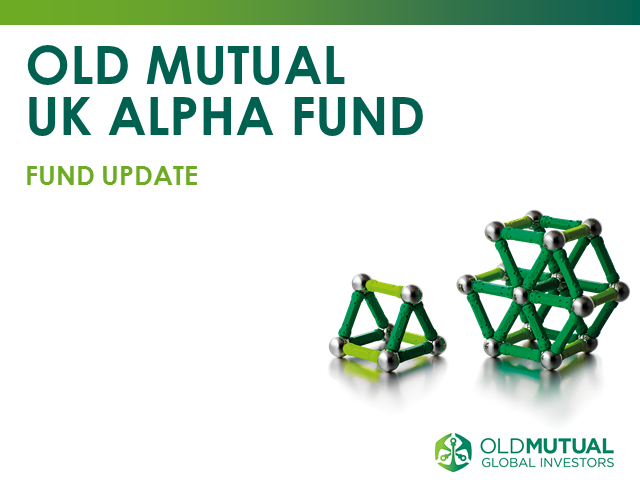 Richard will also give an update on the Old Mutual UK Alpha Fund and will be able to answer your questions at the end of the call. To submit your questions to Richard please email clientservices@omglobalinvestors.com. Please join us for our quarterly review call to discuss the performance of the Merian Global Equity Absolute Return Fund (GEAR) and long only funds managed by the global equities team. Ian Heslop, head of global equities, and Justin Wells, strategist, global equities, will update you on their analysis of the market environment, changes in investor sentiment and appetite for risk. Please join Richard Buxton, head of UK equities and manager of the Merian UK Alpha Fund, for his monthly webcast. Richard will discuss fund performance and positioning as well as his views on the likelihood of a no-deal Brexit, what the Fed and ECB may do next and where UK and global equities may be headed. As always Richard will be happy to take your questions. Ned Naylor-Leyland, manager of the Merian Gold & Silver Fund, recently caught up with Portfolio Adviser and discussed the current market environment, where gold fits in and why major central banks hold a large amount of their reserves in gold. Ned Naylor-Leyland, manager of the Merian Gold & Silver Fund, will give an update on the fund, its positioning and the likely opportunities and challenges over the coming months. He will look at the qualities of gold, silver and their underlying equities, and why the advent of heightened volatility could prove a real bonus for holders of the asset class. Nick Payne, head of global emerging markets, will update you on recent developments in global emerging markets equities, where headwinds faced by the asset class in 2018 have been showing signs of easing into 2019. He will detail why he believes that emerging markets equities remain undervalued despite this year’s rally, and explain why he favours investing in higher quality companies. As always, Nick will be happy to take your questions. Please join Richard Buxton, head of UK equities and manager of the Merian UK Alpha Fund, for his monthly webcast. During the call, Richard Buxton will cover a range of topics, including the Merian UK Alpha Fund performance and positioning, Brexit risk and the broader issues that bear watching for financial markets in 2019. As always, Richard will be happy to take your questions at the end of the call. Nick Payne, head of global emerging markets on the opportunities in emerging markets. Please join Mark Nash, head of fixed income, and Nicholas Wall, portfolio manager, as they discuss the 2019 outlook for fixed income markets. They will cover fund performance, macro-economic conditions and the prospects for the dollar, yield and risk. During the call, Richard Buxton will discuss performance and positioning of the Merian UK Alpha Fund, as well as the new year outlook for equities markets, the economy, Brexit and investor sentiment. In this segment of Market Minutes, Ian Heslop, head of global equities, presents his unique insights into the current state of the market environment. Markets have been far more volatile in 2018 than they were in 2017. Watch some of our leading fund managers discuss the implications of this, and their views of how to position for 2019 across a range of asset classes, including equities, bonds, CoCos and gold. Lloyd Harris, manager of the Merian Corporate Bond fund, reflects on an asset class that has been much less volatile than equities. Mark Nash, head of fixed income, takes us on a deep dive into macroeconomics, explaining the key concepts behind quantitative tightening. Huw Davies, investment director, fixed income, explains the reasons behind the growth of CoCos, and makes comparisons with other asset classes, including bank equities and high yield bonds. Ned Naylor-Leyland, manager of the Merian Gold & Silver fund, answers questions about gold, silver, and apolitical money, in a one minute video. Richard Buxton, head of UK equities, Mark Nash, head of fixed income, and Ian Ormiston, manager of the Merian Europe (ex UK) Smaller Companies Fund, address the reasons behind increased market volatility in 2018, and how investors can position for it. Volatility is rising and liquidity is falling in global markets as central banks unwind support. Closer to home, messy preparations for Brexit have undermined some fairly solid economic and corporate fundamentals. Nevertheless, in Richard Buxton's view, plenty of opportunities remain. The Merian Global Investors channel provides access to past, current and future webcasts with our fund managers. Our webcasts provide you with fund updates, product information and up-to-date views on our investment funds as well as our economic and market outlook. Please note that Merian Global Investors was formerly known as Old Mutual Global Investors. Telephone calls may be recorded for security purposes and to improve our customer service.